My research focuses on developing and applying new proxies relevant to reconstructing paleoclimate variation, often in the Pleistocene and Holocene. Methodologically, I focus on isotopic and elemental archives derived from microsampling accretionary carbonate skeletons. This sampling includes mollusk valves, corals, and fish otoliths. I have particular interest in reconstructing how climate influences organisms, including humans, especially as related to paleoecology. This approach often necessitates the investigation of the life history of organisms that may act as paleoclimate indicators and the use of archaeological remains as a source of paleoenvironmental data. 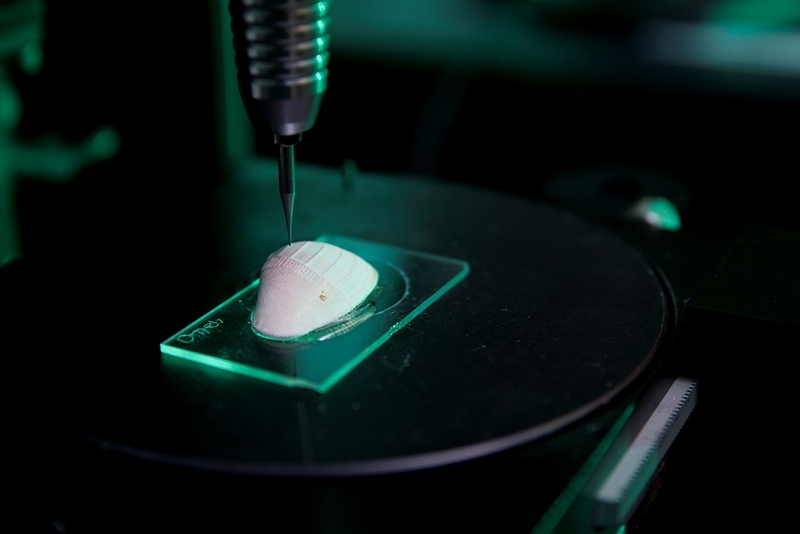 Micromilling a clam valve for geochemical analysis. I have been pursing upwelling-related research in coastal Peru and Chile for a number of years with several students and colleagues. 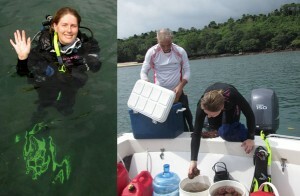 Most recently Miguel Etayo (Ph.D. 2010), Christie Jones (MS 2010), and I measured radiocarbon profiles in various species of mollusks from the coast of Peru to better understand past and present upwelling and radiocarbon reservoir effects associated with El Niño/Southern Oscillation (ENSO). This was part of a NSF funded project in collaboration with colleagues at the University of Maine and the University of Arizona. We are grateful to a large number of Peruvian archaeologists who are providing critical collaboration on this project. Several journal papers resulted from this work and more are being prepared for submission now. 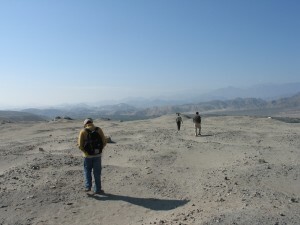 Miguel Etayo and colleagues hiking to Chanquillo, Peru. Atlantic, Pacific, and Gulf of Mexico Donax spp. Thin section in transmitted light showing fine-scale growth increments in a Rangia cuneata valve. Jestina Hansen (MS 2011) and I worked with a colleagues at Dauphin Island Sea Lab (DISL) to assess if nitrogen isotopes preserved in mollusks can give insight into past coastal and marine nitrogen variability. Jestina focused on comparing different extraction methods. 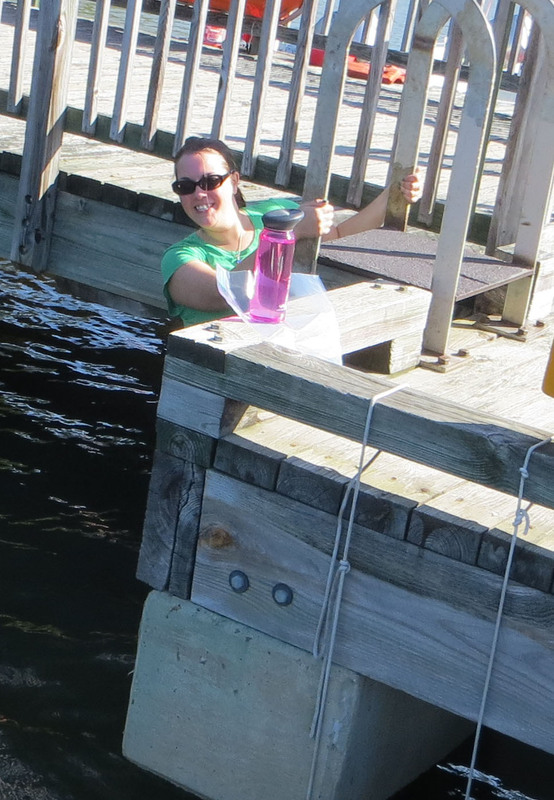 Heather Black (MS 2014) investigated the impacts of diagenesis on mollusk nitrogen isotope records and measuring prehistoric N variation in ancient and modern oyster shells from the Chesapeake Bay area to assess anthropogenic nitrogen inputs over time. Taylor Payne, a current MS student, is conducting a similar study in the Charleston, SC harbor area. 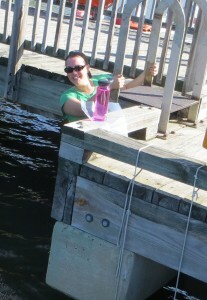 Heather collecting oysters from Chesapeake Bay. Kelley Rich (Ph.D. candidate) is examining the paleoclimatological utility of geochemical records contained in Central American gastropods (Pachychilus spp. – also called jute snails). These snails are common in Maya sites and Kelley hopes that their shell geochemistry may give insight into past rainfall patterns and season of capture. She is monitoring streams in Belize, sampling wild snail shells, and growing snails under controlled conditions in our lab. Kelley and Christie working in the sample preparation lab. 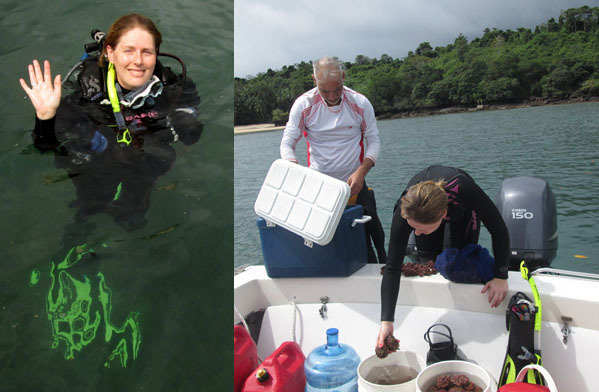 Hillary Sletten, (Ph.D. 2016) conducted several projects focused on developing and applying novel climate/environment proxies in coralline algae. She was awarded a fellowship to conduct research in Panama through the Smithsonian Tropical Research Institute where she collected rhodoliths and performed controlled mesocosm experiments. 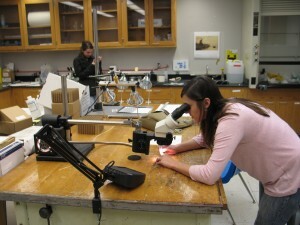 Additionally, she is analyzed geochemical profiles in encrusting algae from Greenland. Hillary collecting rhodoliths along the Pacific coast of Panama. We are also studying the geochemistry of the shallow water Stylaser roseus from the Caribbean in collaboration with colleagues from UA Biological Sciences. 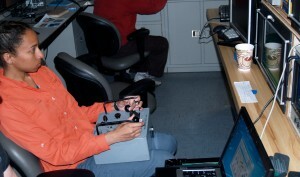 Robin steering the ROV on a research cruise. I am working with colleagues in many regions of North and South America using mollusk geochemistry, biogeography, and related techniques to study shell middens. Our goals are often to assess past human subsistence strategies, season of occupation and resource use, site formation processes, and other questions relating to archaeology. I am presently conducting NSF-funded research into seasonality of subsistence practices along the northern Coast of the Gulf of Mexico with colleagues from UGA and USA. I am doing similar analyses from the Graveline Site, Mississippi excavated by colleagues here at UA. I have long-standing collaborative projects in the Georgia Bight investigating how midden sclerochronology can give insight into season of occupation, past subsistence strategies, site formation processes, and central place foraging models. 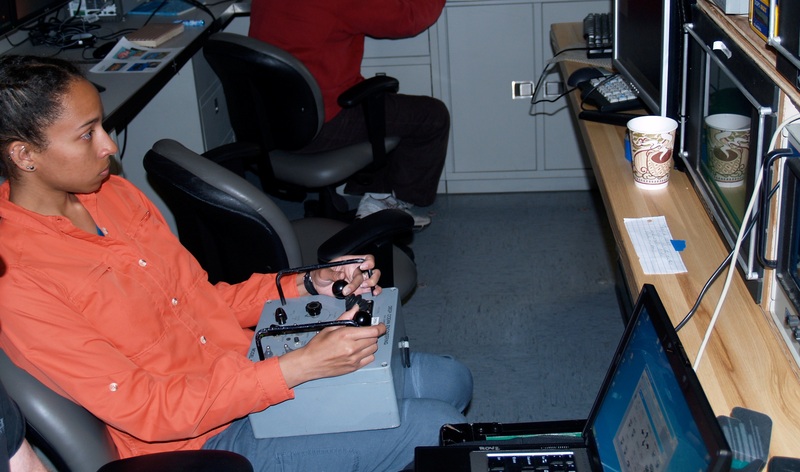 Jiexin Wie (MS, 2014) analyzed Semele spp. valves from Peru to assess their utility as seasonality proxies. Additionally Oindrila Das, postdoctoral researcher in our laboratory, investigated the precision with which one can measure past season of capture in some common midden taxa. 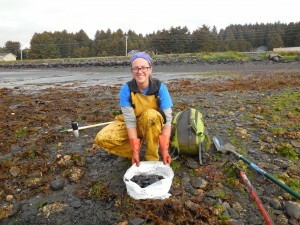 Most recently Ph.D. student Christine Bassett (MS, 2016) is analyzing modern and ancient butter clam shells from the west coast of Canada and Alaska. Her MS research is profiled here. I am working on several other issues that do not fit neatly in the above categories. Some examples include geochemical variation in Cretaceous clams from the Mississippi Embayment, fish migration patterns measured in otolith geochemistry, and sediment core proxies from estuarine and lacustrine environments in the Northern Gulf of Mexico. I have also begun exploring some projects in coastal China and recently traveled to visit Ocean University. Selected publications of the past 10 years. Highlighted text links to complete articles through institutional repositories. Zimmt, J. B., Lockwood, R., Andrus, C. F. T., and Herbert, G. S., 2019 Sclerochronological basis for growth increment counting: a reliable technique for life-span determination of Crassostrea virginica from the Mid-Atlantic United States. Palaeogeography, Palaeoclimatology, Palaeoecology. 516: 54-63. 10.1016/j.palaeo.2018.11.029. Etayo-Cadavid*, M. F., Andrus, C. F. T., Jones, K. B., and Hodgins, G. W. L. 2018. Subseasonal variations in marine radiocarbon reservoir age from pre-bomb Donax obesulus and Protothaca asperrima shell carbonate. Chemical Geology. 10.1016/j.chemgeo.2018.07.001. Bassett*, C., Andrus, C. F. T., and West, C. F. 2018. Implications for measuring seasonality in the marine bivalve, Saxidomus gigantea. Chemical Geology. 10.1016/j.chemgeo.2018.07.004. West, C. F., Burchell, M., and Andrus, C. F. T. 2018. Molluscs and paleoenvironmental reconstruction in island and coastal settings: variability, seasonality, and sampling. In Giovas, C. M., and LeFebre, M. J., eds. Zooarchaeology in Practice: Case Studies in Methodology and Interpretation in Archaeofaunal Analysis. Springer. Cham, Switzerland p.191-208. Lulewicz, I. H., Thompson, V. D., Pluckhahn, T. J., Andrus, C. F. T., and Das, O. 2017. Exploring oyster (Crassostrea virginica) habitat collection via oxygen isotope geochemistry and its implications for ritual and mound construction at Crystal River and Roberts Island, Florida. Journal of Island and Coastal Archaeology. 13:3, 388-404. doi: 10.1080/15564894.2017.1363096. Wei*, J., Andrus, C. F. T., and Perez-Huerta, A., 2017. Semele corrugata microstructure and oxygen isotope profiles as indicators of seasonality. in Dillehay, T. D., ed. Where the Land Meets the Sea: Fourteen Millennia of Human Prehistory on the North Coast of Peru. University of Texas Press. Austin, TX. p.714-722. Sletten*, H. R., Gillikin, D. P., Halfar, J., Andrus, C. F. T., and Guzman, H. 2017. Skeletal growth controls on Mg/Ca and P/Ca ratios in tropical Eastern Pacific rhodoliths (coralline red algae). Chemical Geology. 465: 1-10. doi: 10.1016/j.chemgeo.2017.05.010. Black*, H. D., Andrus, C. F. T., Lambert, W. J, Rick, T., and Gillikin, D. P., 2017. δ15N values in Crassostrea virginica shells provides earliest direct evidence for nitrogen loading to Chesapeake Bay. Scientific Reports. 7: 44241; doi: 10.1038/srep44241. Sletten*, H. R., Andrus, C. F. T., Guzman, H. and Halfar, J., 2017. Re-evaluation of using rhodolith growth patterns for paleoenvironmental reconstruction: An example from the Gulf of Panama. Palaeogeography, Palaeoclimatology, Palaeoecology. 465: 264–277. Darrow, E. S., Carmichael, R. H., Andrus, C. F. T, and Jackson, E. H., 2017. From middens to modern estuaries, oyster shells sequester source-specific nitrogen. Geochimica et Cosmochimica Acta. 202: 39–56. Waselkov, G. A., Andrus, C. F. T, and Plumb, G. E.,eds. 2016. A State of Knowledge of the Natural, Cultural, and Economic Resources of the Greater Mobile-Tensaw River Area. Natural Resources Report NPS/NRSS/BRD/NRR 2016/1243. Biological Resources Division, National Park Service, Fort Collins, CO. pp.240. Plumb, G. E., Waselkov, G. A., Andrus, C. F. T., and Finch B., 2016. A greater Mobile-Tensaw area: connections and consequences. In Waselkov, G. A., Andrus, C. F. T, and Plumb, G. E., eds. A State of Knowledge of the Natural, Cultural, and Economic Resources of the Greater Mobile-Tensaw River Area. Natural Resources Report NPS/NRSS/BRD/NRR 2016/1243. Biological Resources Division, National Park Service, Fort Collins, CO. p. 185-193. Gagnon, C. M., Andrus, C. F. T., Ida, J., and Richardson, N. 2015, Local water source variation and experimental chicha de maíze brewing: implications for interpreting human hydroxyapatite δ18O values in the Andes. Journal of Archaeological Science: Reports. 4: 174–181. Thompson, V. D., Pluckhahn, T. J., Das, O. and Andrus, C. F. T. 2015, Assessing village life and monument construction (cal. AD 65-1070) along the Central Gulf Coast of Florida through stable isotope geochemistry. Journal of Archaeological Science: Reports. 4: 111–123. Blitz, J, H., Andrus, C. F. T., and Downs, L. 2014, Sclerochronological measures of seasonality at a Late Woodland mound on the Mississippi Gulf Coast. American Antiquity 79: 697-711. Etayo-Cadavid*, M. F., Andrus, C. F. T., Jones, K. B., Hodgins, G. W. L., Sandweiss, D. H. Uceda-Castillo, S., and Quilter, J. 2013. Marine radiocarbon reservoir age variation in Donax obesulus shells from Northern Peru: Late Holocene evidence for extended El Niño. Geology 41: 599–602. Pérez-Huerta, A. Etayo-Cadavid, M. F., Andrus, C. F. T., Jeffries, T. E., Watkins, C., Street, S. C., and Sandweiss, D. S. 2013 El Niño impact on mollusk biomineralization – Implications for trace element proxy reconstructions and the paleo-archeological record. PLoS ONE 8: e54274. Andrus C. F. T. 2012. Isotope sclerochronology in southeastern US archaeology to estimate season of capture. in Reitz, E. J, Quitmyer, I. R., and Thomas, D. H. eds. Seasonality and Human Mobility Along the Georgia Bight. American Museum of Natural History Anthropological Papers 97: 123-133 . Andrus C. F. T. 2011. Shell midden sclerochronology. Quaternary Science Reviews 30: 2892-2905 (invited). Andrus, C. F. T., and Thompson, V. D. 2011. Determining the habitats of mollusk collection at the Sapelo Island Shell Ring complex, USA using oxygen isotope sclerochronology: Journal of Archaeological Science 39: 215-228. Thompson, V. D. and Andrus, C. F. T., 2011, Evaluating mobility, monumentality, and feasting at the Sapelo Island Shell Ring Complex: American Antiquity 76: 315-343. Jones, K..B., Hodgins, G.W.L., Etayo-Cadavid*, M. F., Andrus, C. F. T., and Sandweiss, D. H., 2010, Centuries of marine radiocarbon reservoir age variation within archaeological Mesodesma donacium shells from southern Peru: Radiocarbon 52: 1207-1214. 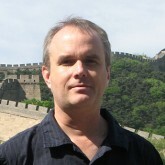 Jones, Kevin.B., Hodgins, Gregory W.L., Andrus, C. Fred T., and Etayo-Cadavid*, Miguel F., 2010. Interpreting molluscan marine reservoir ages in a variable-upwelling environment: Palaios.25: 126-131. DOI: 10.2110/palo.2009.p09-050r. Pérez-Huerta, A. and Andrus, C. F. T. 2010. Vital effects in the context of biomineralization. in Díaz, L. F. and García-Monge, J. M. A. eds., Biominerals and biomineralization processes. Seminarios de la Sociedad Española de Mineralogia: Madrid v. 7, p. 31-41. Jones, Kevin. B., Hodgins, Gregory W.L., Etayo-Cadavid*, Miguel F., and Andrus, C. Fred T., 2009. Upwelling signals in radiocarbon from early 20th century Peruvian bay scallop (Argopecten purpuratus) shells: Quaternary Research 72: 452-456. DOI: 10.1016/j.yqres. 2009.07.008. Romanek Christopher S., Beard, Brian L., Anbar, Ariel D. and Andrus, C. Fred T., 2009. Non traditional stable isotopes in the environmental sciences, in Aelion, C. M., Hohener, P., Hunkeler, D.,Â and Aravena, R. eds., Environmental isotopes in bioremediation and microbial degradation processes. Boca Raton, FL , CRC Press, pp. 383-433. Andrus, C. Fred T., and Rich*, Kelley W. 2008. A preliminary assessment of oxygen isotope fractionation and growth increment periodicity in the estuarine clam Rangia cuneata. Geo-Marine Letters. DOI: 10.1007/s00367-008-0109-3. Reitz, Elizabeth J., Andrus, C. Fred T., and Sandweiss, Daniel H. 2008. Ancient fisheries and marine ecology of coastal Peru. In Human Impacts on Ancient Marine Ecosystems. edited by Torben C. Rick and Jon M. Erlandson, University of California Press. pp. 125-145. Andrus, C. Fred T. and Crowe, Douglas E., 2008. Isotope analysis as a means for determining season of capture for Mercenaria. In Native American Landscapes of St Catherine’s Island, Georgia. edited by David Hurst Thomas. American Museum of Natural History, Anthropological Papers, 88: 498-518. Andrus, C. Fred T., Sandweiss, Daniel. H. and Reitz, Elizabeth J. 2008. Climate change and archaeology: The Holocene history of El Niño on the coast of Peru. In Case Studies in Environmental Archaeology, (Second Edition). edited by Elizabeth J. Reitz, C. Margaret Scarry, and Sylvia J. Scudder. Plenum Press, New York. pp. 143-157.